At best, I slept three hours last night, and they were three constantly interrupted hours. So, I'm not very awake. Outside, it's sunny and hot. Currently, the temperature in Birmingham is 84˚F, with a heat index of 90˚F. Yesterday, a line of thunderstorms moved in early in the afternoon and cooled everything off. There was torrential rain, and the temperature dropped from 93˚F, with a heat index of 99˚F, to only 79˚F (with no heat index) in the space of an hour or so. I must have unpacked at least forty boxes of books. They're stacked helter skelter on the shelves in my office. Today, I'll try to begin to sort them, sleep or no sleep. But tomorrow I have to get back to work and finish "A Chance of Frogs on Wednesday," which I had to set aside on June 9th. Late in the day, we took a break from unpacking and breaking down boxes and hauling them to the trash, and we drove out towards Leeds, along the back roads. The storms had passed, and it was gorgeous, all the mimosa and kudzu and everything else. We stopped a few minutes along the Cahaba River. The water was muddy and high, from all the rain. Last night, third night of chili and we finished Spooky's birthday cake. We watched Blake Edwards' The Great Race (1965), long a favorite of mine. And then I didn't sleep. There are wolf spiders all about the apartment, helping to control the insects. 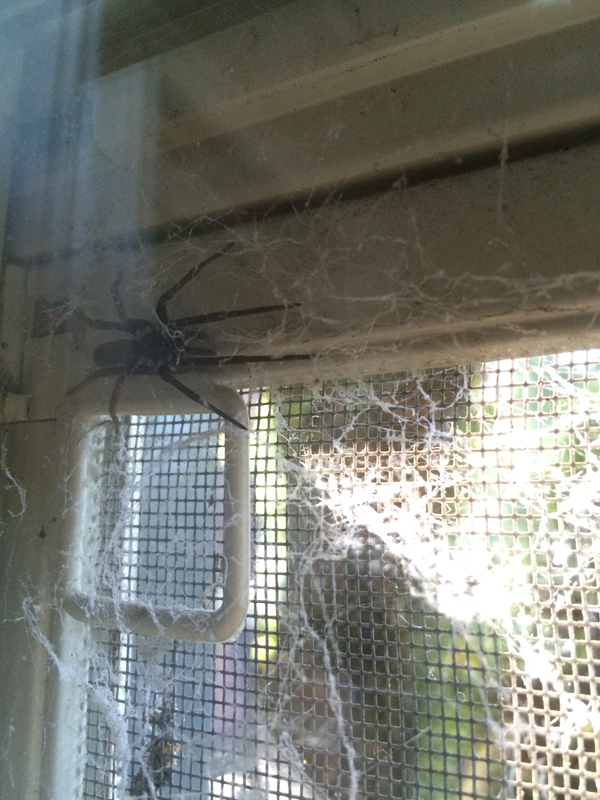 There's a large one living on one of our bedroom windows (see photo below). I've missed these guys. Current Music:Lord Huron, "The Balancer's Eye"
Rains, and green, and mimosa and back roads...it almost makes me want to live in Alabama. If you think of it, please take a photograph (is it still a photograph if it's taken with an iPhone?) of the bookshelves once they're decent. Will do. But that's gonna take a while. I look forward to seeing the completed shelves as well! And more wolf spiders.